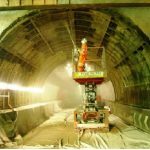 Two disused rail tunnels, Bowshank (200m long) and Torwoodlee (62m long) just north of Galashiels) needed brickwork repairs and strengthening works prior to the lowering of the tunnel invert and laying of new track slab within the tunnels. The works comprised pre-construction trials prior to back-grouting of the tunnel brickwork to infill voids and divert groundwater, core drilling and installation of new drainage pipes in sidewalls. 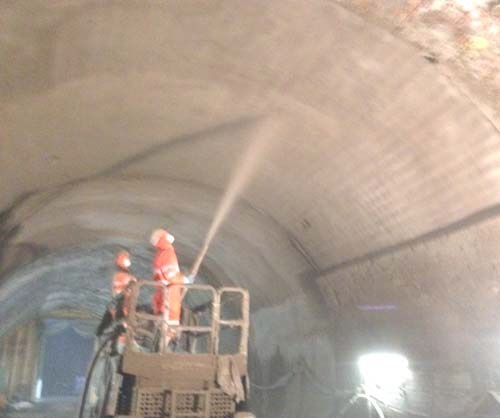 The removal of approximately 10% of the tunnel brickwork was followed by re-instatement with sprayed concrete in the tunnel crowns and side walls. The brickwork removal was carefully monitored and controlled to ensure that the tunnel profile remained unchanged and that sound brickwork was left un-disturbed during the works. As the disused tunnels had become home to colonies of bats, exclusion measures were established to ensure the works programme could be maintained, including the simple insertion of recycled cloths into drilled grout holes as a temporary barrier to bats roosting overnight.